I’m posting this in honor of Rare Disease Day today. I have a few friends who have a child with a rare disease, and one amazing friend who lost her son to a rare disease. I can’t begin to understand what their lives look like, inside and out, but I had a tiny glimpse of what it’s like to live without answers in regards to a medically dependent child. Have you ever had a sick child? I don’t mean the flu. I’m talking scary sick…hospital sick. Medicines you never dreamed of giving any child and so many unanswered questions. There are parents who experience this everyday. Unfortunately, I have had tiny glimpses into this world. These briefs periods can’t compare to a lifetime of sickness and unanswered questions, but here is the slightest idea of what every day might feel like for a parent with a very sick child. Those few hours passed and turned into weeks. My sweet newborn was struggling to breathe, something I’m sadly familiar with. My first son had the same issue as well as my 3rd. This time it was different though…there was a medical error. The doctors increased the oxygen inflating his lungs too much and punctured his lung; my sweet, helpless baby was in so much pain caused by professionals that I trusted. The pain was so unbearable that morphine was prescribed. Yes, morphine for a newborn. From my experience, when your baby is in the NICU, split decisions are made without your consent, so he was given morphine without my knowledge as it was deemed necessary for his survival. The morphine caused my tiny angel to stop breathing completely. It relaxed his body too much. What’s more, after this episode, we had to try the morphine once again, in a smaller dose, as the pain was causing him to struggle for life. The guessing of the doctors, the trial and error…it all left me helpless. There were no answers. The doctors didn’t know if this would work. They didn’t know if he’d stop breathing again, and they didn’t know when his lung would heal. 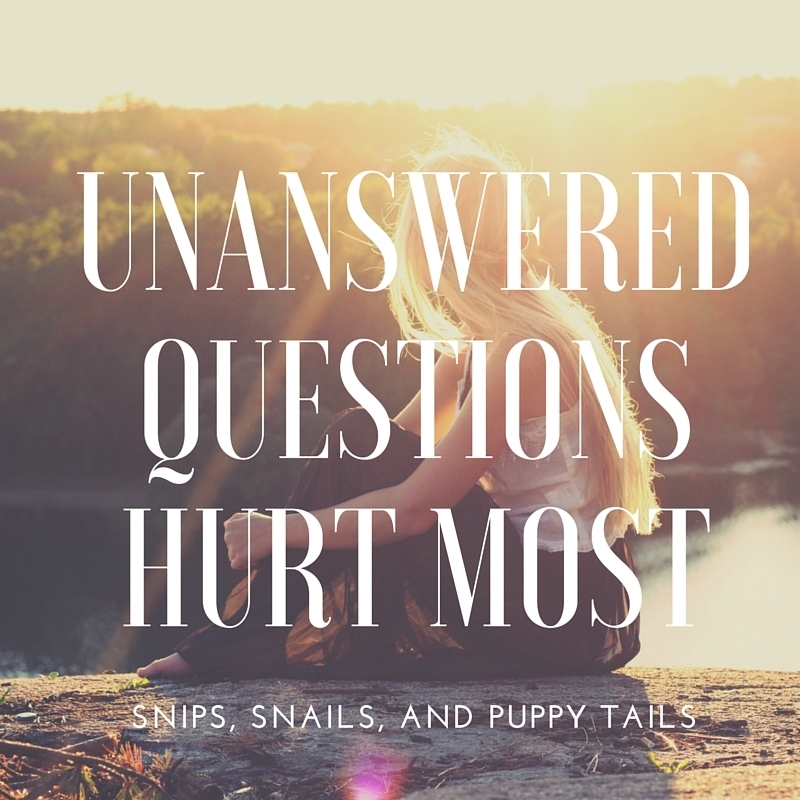 The unanswered questions hurt most. Unfortunately, this was not my only experience with unanswered medical questions. When my 3rd son was born, he was also in the NICU but then was later airlifted to a Pediatric ICU. The doctors told me he was fine, but I insisted that he wasn’t. Then their lack of concern transformed into puzzled looks on everyone’s face when they witnessed my tiny baby coding in my arms in the ER. Specialist after specialist poked and prodded my newborn baby. My husband and I waited helplessly on the sidelines. I just kept telling myself: parents should be in the game not on the sidelines, but when your child is sick and everyone is doing what they can but are still puzzled, you are left watching from the sidelines helpless. No amount of crying or yelling will get you any closer to the answers you are seeking; it’s a torturous sit and wait game. Every test that came back normal left me more and more anxious. My son coded, fell lifeless in my arms, and no one can tell me why?! How is this possible? Every new test and specialist gave me a glimmer of hope for an answer, but the answers never came. After 3 long days of constant testing in the ICU and another 11 days in the hospital, we were sent home with no concrete answers. The neurologist who saw him almost daily had a “best guess” but no real conclusions. We were sent home on anti-seizure medicine, praying God would heal him. We were one of the lucky ones. God did heal our son. He was later diagnosed with Autism, but his physical issues were healed. I’m sure you can imagine the anguish my husband and I felt with each of our children in the hospital. Now imagine that this is every day life. You may have some answers or “best guesses”, but they are often open ended. Your child’s life and well being are left in the balance of this guessing game played by a plethora of professionals with titles you can barely pronounce. This is often what it’s like for parents with children who have rare diseases. I only experienced life with a very sick child for a short period of time, but it’s nothing I wish on anyone. As a parent, we are our children’s protectors, but with a life threatening illness, we can’t always protect them. It’s a feeling of helplessness and heartache. I share this with you, because there are parents who are dealing with the unknown of their child’s severe illness everyday. These parents need your support. During these trying times, every prayer mattered to us. Every kind text and phone call chipped away at the helplessness. Meals and babysitting were a God sent. It all mattered and made a huge impact. If you know anyone with a sick child, consider reaching out. It made a huge difference in our life when our sons were sick. For you parents experiencing the intense hardship of having a very sick child, remember God is in control. He knows what is ailing your child. He is the ultimate doctor, an amazing healer, so when I didn’t have answers, I did my best to rest in the fact that God has the answers. He hears every single prayer. Your pleading doesn’t fall on deaf ears, and when you can’t talk but only cry, He knows. He understands your heartache, your helpless feelings. I am not saying that by pleading with God, He will heal your child, but He can and will bring comfort no medical answers can. In all of this, I have learned that God is in control. He was the father of my children before I was even their mom. How much more does He love my son than I could ever fathom? All of this has taught me to let go, and give it to God. I felt helpless, but really, we have the world’s best healer and comforter on our side. He is on your side. He loves your child more than you could even imagine. His love is deeper than the ocean, deeper than humans even know. He is in charge and has a plan, AND He has the answers even when the doctors don’t. Seek Him always but especially in these helpless moments. He is there.